It’s summertime and you know what that means….. VACATION! Whether you are headed to the beach for a week, road tripping to see family or exploring the great outdoors, we know that worrying about clean-eating and still having fun is the last thing you want to do! We are taking the stress out for you. We have compiled a list of some of our best tips and tricks to make clean-eating easy on your next getaway. The Boy Scouts say it best...Be Prepared! A little bit of work at home before you leave will guarantee a much more enjoyable trip once you hit the open road. Are you driving somewhere? Pack easy, shelf stable snacks to ensure no one gets those hangries 4 hours into vacation. Fresh whole fruit, nuts, seeds, popcorn, fruit leathers, jerky, applesauce pouches, granola and plain chips make for great minivan picnics! Don’t forget bottles of water or seltzer to stay hydrated; just know where those rest stops are for sudden bathroom breaks! Can you eat out? Yes! Before heading out, use the web to find restaurants that will support your eating goals while traveling. From bloggers to top-10 lists, the work might already be done for you. “Best gluten-free restaurants in Hilton Head” and “best dairy-free treats in Chicago” will help your family to make the healthy choice, the easy choice. Staying at a condo or AirBNB? If your home away from home has a kitchen, you are in luck. Take an afternoon before you head out to make a few Crock Pot or casserole dishes and freeze them. Then you will have whole dinners ready to go, so after a day of sightseeing and swimming, you get to come ‘home’ to wonderful, approved dinners. Lots of breakfast items, like pancakes, muffins and waffles freeze well too and make for great, no fuss ways to start the day. Know where your local grocery stores are. 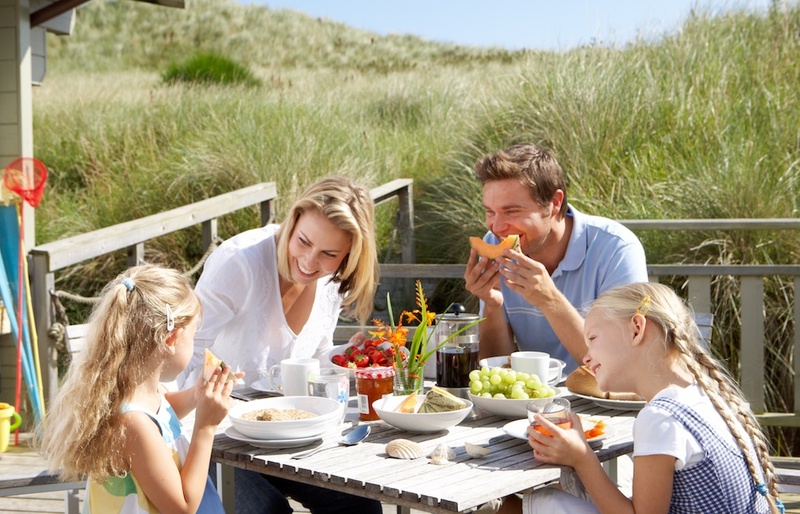 It might not sound like the most fun thing to do once you finally arrive at your destination but if you can hit up your local Aldis or Kroger, then you can get your family set up for your entire stay. Get more snacks to replace the massive amount of food that was eaten during the car trip, get 100% juice boxes for easy breakfast drinks and to pack for days when you are out-and-about. Traveling abroad? Find a translation app to ensure that you can clearly communicate your needs. And finally, be open and direct with all travelers about expectations. Your kiddos may associate vacation with getting ice cream every day or some other treat. Let them know how this vacation may differ from past ones, but reassure them that you can work together to make sure it is just as special and fun. Be flexible! Things won’t always go smoothly. Even the best laid-out plans can go awry so have back-up plans. Stores like Whole Foods make for wonderful emergency visits because of their selection of hot-and-cold ready-to-go food. Everything is labeled with ingredients so you don’t have to work hard to find what is the best option and what isn’t. Ask for help! Don’t let the burden of keeping your family in line fall on one person, you! Get your kiddos involved in making decisions. Staying with family for your trip? Connect with them before the trip to teach them how you make it work for the family and see if they will help out during vacation too. Sometimes extended family members get nervous trying to feed those with dietary restrictions but once you explain it, they may feel ready to accommodate those restrictions for a big family meal. Wouldn’t that be a lovely break for you? !